Sedona AZ (September 10, 2015) – Yavapai College’s Osher Lifelong Learning Institute (OLLI) of Sedona and the Verde Valley is pleased to announce the start of its Fall quarter on September 28, 2015. Over 140 offerings in both Learning Group and Workshop style are available, crafted by enthusiastic and dedicated facilitators who believe strongly in lifelong learning. 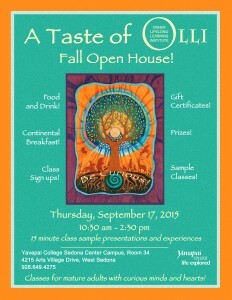 Prior to the start of the term, classes can be sampled at our open house event – “A Taste of OLLI” – on September 17 from 10:30 to 2:30 p.m. at the Yavapai College Sedona Center Room 34. There will be refreshments and lunch provided, and sample classes presented in four different classrooms throughout the day. Come and decide what you want to take, meet facilitators and talk with OLLI members. This Fall, learning groups (classes) and workshops take place at the Yavapai College campuses in Sedona and Clarkdale and—for the first time—in Camp Verde. Learning groups meet weekly for six to eight weeks. There are traditional learning group favorites and new offerings in the catalog, such as “The Colorado Plateau – A Virtual Field Trip” and other local interest classes, various memoir and writing classes, News & Views, science, history and metaphysical subjects, to name but a few. 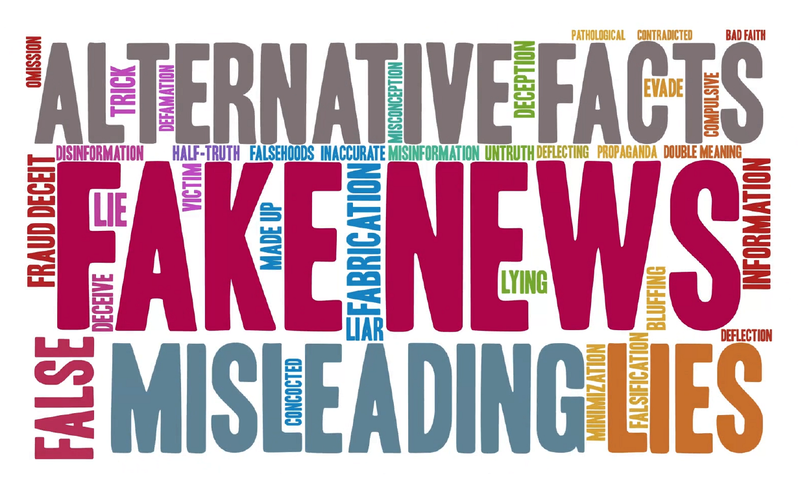 There are also free programs open to the public, including Arizona Humanities lectures, and our Lunch and Learn Program which meets Wednesdays on the Sedona campus, beginning September 30. The Lunch and Learn series features speakers who are involved with our local community and beyond. Beginning October 1, on Thursdays, a weekly keynote speaker series, Brown Bag Brain Buzz, will take place on the Verde Valley Campus from 12:30 to 1:30 p.m. These talks focus on great minds and ideas that have shaped human history. Cannot commit to a learning group? Please enjoy our offerings of fascinating and engaging workshops and presentations which cover a wide array of themes from history to personal finance and many more. OLLI is a dynamic organization within Yavapai College created to meet the needs of intellectually active mature adults. What makes OLLI a unique learning experience is that it has no tests, grades, or papers. It is a gathering of people who are endlessly curious and love to learn. None of these learning groups, presentations, or workshops would be possible without the heart, passion, and steadfast dedication of the OLLI facilitators who volunteer to lead members in lively discussion and interaction. OLLI is always in search of individuals or groups interested in sharing their knowledge, expertise, passion, or interests with others. OLLI invites you to be a facilitator for Winter or Spring sessions in 2016. You do not have to be a retired professor from a university to facilitate a class. The main requirement is a passionate interest in a subject. If you feel that you have valuable life experience, have researched a topic well in your life, are a professional who might have valuable information for mature adults, or have a passion for a topic, you can be an OLLI facilitator! There is no greater reward than to share what you love with others. The Fall catalog can be viewed online at here. 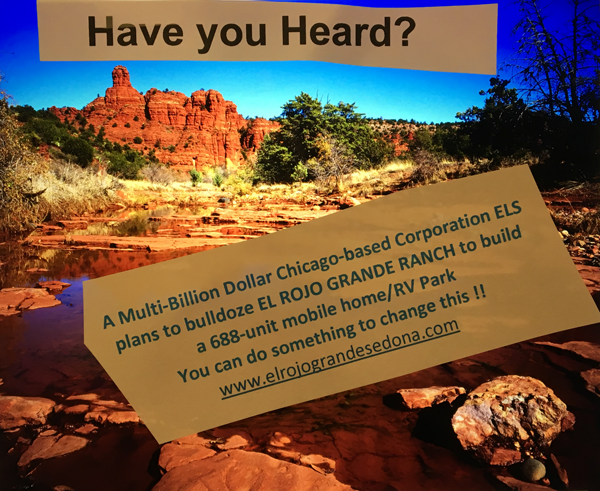 For more information, call 928-649-4275. 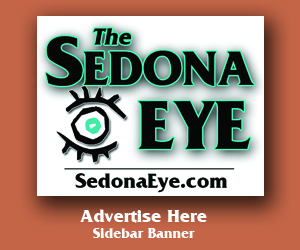 Catalogs are available at many public locations in Cottonwood and Sedona. This is more than Sedona. It is every backyard. And not in mine. Joens is the worst politician and ambitious like all get out. Walking on our graves to get power in the valley. They want to ruin the Rez and get our rights back. Is there no morality left here? Your notice reminded me. Lucky we have this great program.